There was an unusual sight in Paris on Wednesday: long lines at market kiosks and newsstands before the sun even came up. The customers were waiting for Charlie Hebdo, one week to the day after terrorists stormed the satirical French magazine's offices and killed 12 people, including its senior-most cartoonists. Buyers said they wanted a piece of history and needed to support freedom of expression. By sunrise, the magazine was mostly sold out in central Paris. Workers encouraged customers to come back Thursday, promising there would be more copies of the magazine then. In the meantime, copies are selling for hundreds of dollars on eBay. As newsstands ran out of copies, Charlie Hebdo columnist Patrick Pelloux wrote on Twitter, "Thank you, and rest assured we will reprint and redistribute." 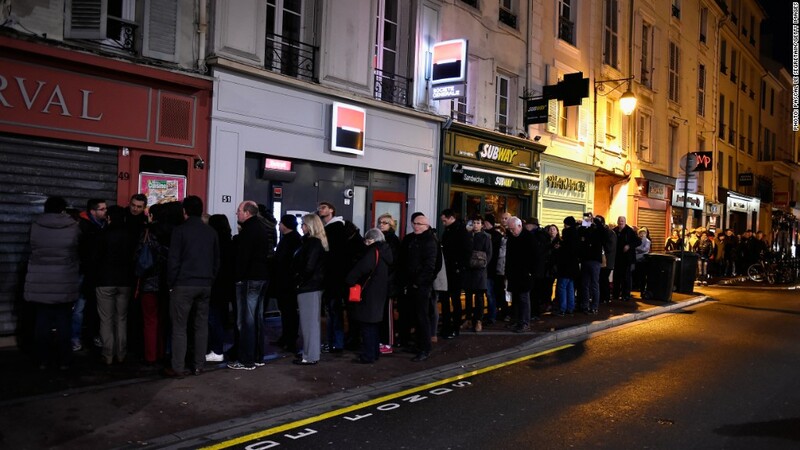 A queue of people wait outside a kiosk to get a copy of Charlie Hebdo in a suburb of Paris. The initial plan called for 3 million copies to be distributed in France and other countries, a fifty-fold increase from Charlie Hebdo's typical weekly circulation of 60,000. But the new goal is 5 million. 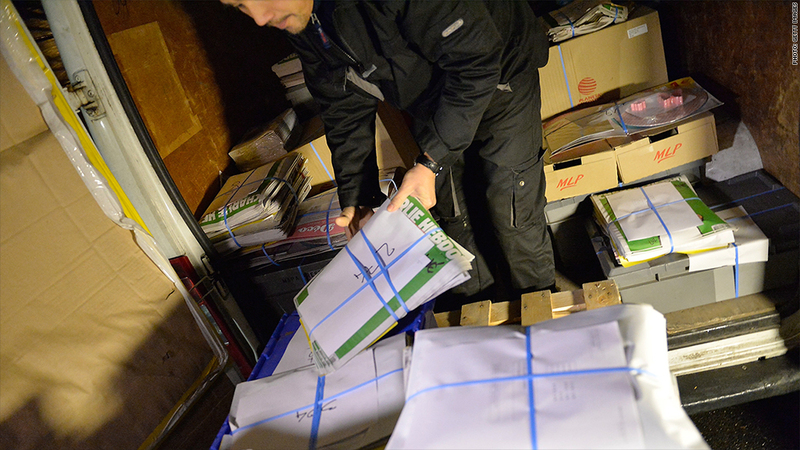 A spokesman for the magazine distributor said the first 1 million copies were released during the day on Wednesday. "1 million tomorrow Thursday, 1 million Friday and then 1 million for the weekend," the spokesman, Michel Salion, told CNNMoney via Twitter. "Last 1 million for restocking next week." The magazine's release has been highly controversial, largely because on its cover is an illustration of a tearful Prophet Mohammed, holding up an "I am Charlie" sign accompanied by the words "All is forgiven." Depicting Mohammed is a taboo in the Muslim world. The magazine's past cartoons of the prophet apparently motivated the attackers in last week's slaughter. The new cover was met with mixed emotions -- with some calling it a bold example of free speech and others criticizing it as needlessly offensive to Muslims. CNN's Arwa Damon, at a predominately Muslim neighborhood in Paris, said people there "are actually quite upset" and feel insulted by the cover image. And CNN's Phil Black, at another newsstand in a different part of the city, said the customers he spoke with "overwhelmingly believe that the tone of the image is right. They say it is touching. It is defiant. It is irreverent." A court in Turkey, meanwhile, ordered a ban on websites showing the latest Charlie Hebdo cover. The issue itself is unapologetic -- ridiculing religion while expressing appreciation for the public's support in the wake of the attack. "Charlie has a lot of new friends," proclaims a letter on page two of the new issue. The letter thanked the "millions" of supporters "who are really on our side, who sincerely and deeply 'are Charlie,'" an invocation of the "Je suis Charlie" -- "I am Charlie" -- slogan that is now omnipresent here in the French capital. One of the cartoons in Wednesday's issue is titled "Keep Calm and Charlie On," a riff on the British saying "Keep Calm and Carry On." -- John Berman, Arwa Damon, Claire Calzonetti, Julian Cummings, and Phil Black contributed reporting from Paris.